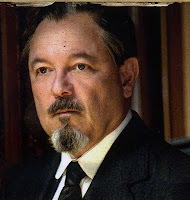 MEXICAN HISTORY: The movie, For Greater Glory, is based on a true story of the Cristiada in Mexico and will be in theaters June 1, 2012. It’s a tragic story of how Mexican Catholics fought for their freedom of religion in Mexico. The assault on religious freedom began when Mexico adopted a Constitution in 1917 which contained strong anticlerical language, setting the stage for organized resistance against the government. MEXICO’S PRESIDENT in 1924 was Plutarco Elias Calles. The Calles administration aggressively attacked the teachings of the Catholic Church. In 1926 a shootout occurred between 400 armed Catholics, who shut themselves in the Church of Our Lady of Guadalupe, in Guadalajara, in Jalisco state, against federal troops. The altercation left 18 dead and 40 injured. A DAY after the Guadalajara shootout, federal troops stormed a Catholic church in Sahuayo, in the State of Michoacan, where the pastor and his vicar died in the violence. Federal troops also raided the home of St. Luis Batiz Sainz, a priest and member of the Knights of Columbus, killing him with three members of the Mexican Association of Catholic Youth. A YEAR LATER, the formal Cristero rebellion began with the release of “A la Nacion” [To the Nation], a document written by Rene Capistran Garza, a leader of the Mexican Association of Catholic Youth. It decried the attack on religious freedom and urged organized resistance. The Cristero fighters received the support of Catholic women who formed the Feminine Brigades of St. Joan of Arc. A parish priest and member of the Knights of Columbus, St. Rodrigo Aguilar Aleman, was tortured and martyred by Mexican troops that same year. YOUNG Jose Sanchez del Rio convinces his mother in 1927 to let him join the Cristeros. The youngster served as a flag bearer. On Feb. 10, 1928, Jose was martyred after refusing to renounce his faith. In 1929, The Cristero fighters and the government reached an agreement to end the conflict. The government agreed to permit public worship and the Catholic bishops agreed to cease calls for the elimination of constitutional language against religious freedom. BLESSED Pope John Paul II beatified 25 Cristero martyrs in 1992 and in 2000 he canonized all 25 as saints. On Nov. 20, 2005 on Christ the King Sunday, Pope Benedict XVI beatified another group of 13 Cristero martyrs, including Blessed Jose Sanchez del Rio. “FOR GREATER GLORY” stars Andy Garcia as Enrique Gorostieta Velarde, Eva Longoria as Tulita, Ruben Blades as President Plutarco Elias Calles, Peter O’Toole as Father Christopher, Eduardo Verastegui as Blessed Anacleto Gonzalez Flores and Mauricio Kuri as Blessed Jose Sanchez de Rio; and actors Oscar Isaac, Santiago Cabrera and actress Catalina Sandino Moreno [Academy Award Nominee]. Shooting of the movie was done on historic locations throughout Mexico. “EVERY person of faith should draw courage from the tragically heroic witness of the Cristeros. Their sacrifice reminds us that unless we learn from history, we risk repeating it. Besides being an important movie, it is extremely well done,” said Father Andrew Small, National Director, Pontifical Mission Societies. FOR MORE information on ticket purchases—including getting posters, flyers and other promotional materials—contact The Maximus Group at 1-877-263-1263. A TEN COUNT: Champion boxer Johnny Tapia, a Mexican-American, died Sunday, May 27, 2012 at his Albuquerque home. It was reported his death did not appear suspicious. Tapia 5 feet 6 inches, was a five-time boxing champion who had a turbulent career. His chaotic life included jail-time, struggles with mental illness, suicide attempts and being declared clinically dead five times as a result of drug overdoses. He was 45. TAPIA WON the WBA bantamweight title, IBF and WBO junior bantam eight titles and the IBF featherweight belt. Tapia was married to Teresa Tapia in 1994 and had two children where he lived with in Albuquerque, NM. 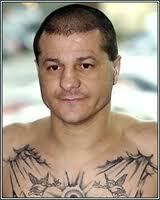 Tapia had many tattoos, which were prominent when he was fighting. One of them said Mi Vida Loca ("My Crazy Life"), the nickname he adopted. He wrote an autobiography by that title. IT’S TRADITONAL in the sport of boxing to honor the memory of a deceased boxer by giving him a ten count of the boxing bell to signify that the boxer is out. The fans stand in silence as the bell is solemnly struck slowly ten times. Tapia, will always be remembered a great warrior, a Champion and one of a kind. ST. ANTHONY Hospital, 2875 W. 19th St. is a faith based non-profit community teaching hospital founded in 1896 that services the Little Village community. For over 100 years, St. Anthony physicians and staff have provided medical care, social services and community outreach to Chicago's near southwest side communities. SUMMERFEST: St. Anthony is sponsoring its Sixth Annual Family Summerfest on Saturday June 9, 2012 from 10 a.m. to 3 p.m. Families are invited to the Summerfest to play carnival games, enjoy a variety of local entertainment and sample the menus of neighborhood restaurants. The event is free to the general public and each family who register will receive a free back pack for each child in the family. FOR MORE information contact Rita Esquiliano, Director of Community Relations, at 773/484-4396, or email resquili@SAHChicago.org anyone who wants to participate in the event with a table or tent, give Rita a call. MEMORIAL DAY SALUTE: Veterans gathered Monday, May 28, 2012, Memorial Day to pay homage to fallen comrades at the Manuel Perez Jr. Memorial Plaza, 26th St. & Kolin Ave. Those present were members of the Dr. Hector P. Garcia AMVET Post 326, Manuel Perez Jr. American Legion Post 1017, Mexican American Veterans Association [MAVA] and Military Order of the Purple Heart. TWO WORLD War II veterans Tony Gonzalez [Navy] and Benito Morales [Army] were also present. Bill Luna, Post Commander of the Dr. Hector P. Garcia AMVETS gave recognition to the three Medal of Honor recipients honored in the mural at the memorial plaza: Manuel Perez Jr., WW II; Roy Benavidez, Vietnam and Rudy Hernandez, Korea. “This is the only military memorial plaza in Chicago and sacred ground so that we can pay homage to our deceased military heroes,” said Luna. SPECIAL GUEST were activist Victor Vela from Milwaukee, Wisc. Vela is an Army Vietnam veteran; Abundio Zaragoza, Superintendent of Veteran Assistance Commission of Cook County; Frank Corona, American G.I. Forum of South Chicago and Dominic Delgado, represented the 173rd Airborne Association. A moment of silence was held for Jose Lupe Martinez, a Korean war veteran who recently passed away. After the playing of the taps at the ceremony, the Manuel Perez Jr. American Post Commander Joe Ramirez invited all the veterans, family members and guests for coffee, cake and tamales at their Post headquarters. NEW PRINCIPAL: Interim Principal Tonya Hammaker is the newly contracted principal at Farragut Career Academy High School, 2345 S. Christiana Ave. in Little Village. On Tuesday, May 8, 2012, Farragut’s LSC members voted unanimously to give Ms. Hammaker a 4-year contract effective immediately. MS. HAMMAKER has an impressive resume as an educator. 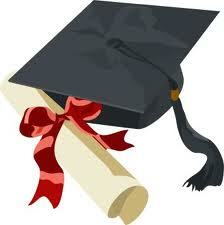 She holds both a Master of Arts in Teaching, Masters of Educational Leadership and a Bachelor of Arts in Psychology. She has extensive experience with curriculum development, data analysis and improvement of school culture; with 11 years experience working in a high school. FOR FOUR years, Ms. Hammaker was a Dean of Instruction at Farragut in 2006-2010 and has been interim principal since January 2012. “I am confident I possess the qualifications to increase student achievement and move Farragut toward becoming a Level I school in excellent standing” said Principal Hammaker. AS INTERIM PRINCIPAL at Farragut, Ms. Hammaker worked diligently to promote a safe environment, increase attendance, celebrate student success, increase parental contact and improve the metrics in order to continue Farragut’s Level II status for this school year. Present enrollment is 1,350. HAMMAKER reinstituted the Student of the Month program, which celebrates student success, offered attendance incentives and created a positive behavior token economy, awarding students for good behavior. Last February she hosted a “Meet the Principal” event to meet parents and learn more about the needs of students and the community. 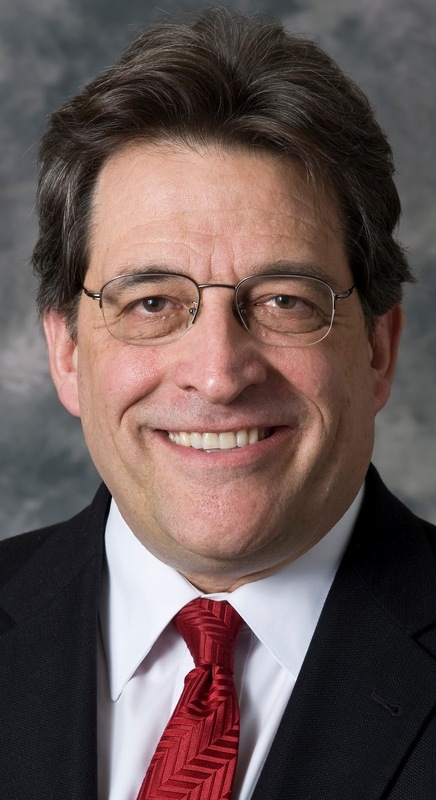 “I have worked with teachers on an individual basis to ensure they have the materials and support needed to improve student achievement,” Hammaker said. LSC MEMBERS who voted were Fabiola Andrade, Maria Avila, Eva Bahena, Antonia Hernandez, Maria Lopez, Martha Ramirez, August Sallas, Maria Silva, Victor Younger, Linda Trevino-Garcia and William Nelson. Ineligible to vote was student representative Leslie Andrade and interim Principal Tonya Hammaker. HAMMAKER SAID: “As principal, I will work closely with the LSC, parents, teachers, students and the community.” We congratulate Ms. Tonya Hammaker and wish her success! 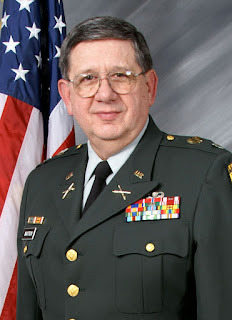 ROTC LEADER: Lt. Col. Ned Matich, 67, is retiring at the end of June after 20 years of service as the Commandant of the General George S. Patton, Jr. U.S. Army JROTC at Farragut Career Academy. For Matich, “It’s like leaving your child behind,” he stated. “I spent more waken hours here [ROTC/Farragut] than at home,” said Matich. LT. COL. MATICH has been an outstanding Commandant and role model for the ROTC cadets. He has taught cadets what he learned from his 24-years of service in the U.S. Army by instilling values, business skills, and strengthened the love of family and country. “The Army made me who I am today,” said Matich. “IT WAS CPS CEO Paul Valles, in 1999, took the public school ROTC programs out of the basement and created the military academies in Chicago” said Lt. Col. Matich. Farragut ROTC is the only in-school academy still functioning and an enrollment of 257 students. Former Farragut principal Edward Guerra gave the ROTC the space at Farragut and paid for the beautiful military art work in the halls and in classrooms. ROTC DATES BACK to 1916 by an Act of Congress and started in Chicago in 1919. Matich said there are two misconceptions about the ROTC:  the ROTC program is to put kids into the military academies, and  the ROTC is a “reform” school. “The ROTC is not a boot camp. We want the best kids who will do better than average,” said Matich. Out of the top ten seniors in this year’s graduating class, eight are ROTC students. There are forty ROTC students in this year’s graduating class and not one will be going to a military academy. “We are giving the ROTC students values and disciplines to carrying them thru life,” Matich said. EVERY THREE years, the ROTC programs are inspected by the U.S. Army. Farragut’s ROTC received a perfect score of 600 points. No other school has scored 600. “Our ROTC cadets marched in the Memorial Day parade which was reinstituted by Mayor Richard M. Daley and won the title of “Best Marching Unit” four times,” Col. Matich said. The ROTC cadets also march in the “Cinco de Mayo”, the “26th Street Mexican Independence Day” parades and have participated in the Manuel Perez Jr. Commemorative Memorial Services and the UNO Memorial School Campus ceremonies. INVITATION: Col. Matich is extending an invitation to all former cadets and their families to an Open House at Farragut Career Academy Sunday, July 1, 2012 from 1 p.m. to 3 p.m. Come and see the ROTC Academy. “I appreciate our relationship over the years,” said Matich. SEN. LANDEK also acknowledged the cadets competitive in Platoon Drill, Orienteering, Color Guard, Rifle Drill and many other demonstrations of military precision, pride and professionalism. MEMORIAL DAY: The Manuel Perez Jr. American Legion Post 107 cordially invites veterans, families, community to the Memorial Day ceremony at the Manuel Perez Jr. Memorial Plaza, 26th & Kolin Ave., Monday, May 28, 2012 at 10:30 a.m. Everyone is also invited immediately after the ceremony to the Post Hall, 2658 S. Hamlin Ave., for coffee, cake and tamales. For more info contact Post Commander Joe Ramirez 773/522-9315. FAREWELL: Jose Lupe Martinez, 81, died on May 19, 2012. “Lupe”, as he was called by his family and friends, was a Korean War Veteran and a recipient of the Silver Star and Purple Heart. He was the husband of Margaret [nee Blas]; father of Cynthia Lozando, Sandra [Jose] Quinero, Lisa Vargas, Richard [Christine] Martinez, Denise [Marcell] McClinton, Della [Mamoon] Aburimileh and the late Dean C. Martinez. He was the grandfather of 19 grandchildren and great-grandfather of 5 great-grandchildren; fond Uncle of many nieces and nephews. LUPE was a member of the V.F.W., Manuel Perez Jr. American Legion Post 1017, American Legion, Mexican American Veterans Association [MAVA]. He will be remembered by fellow veterans and friends as the “first Mexican-American wounded in the Korean War from Illinois”. IT’S FIESTA TIME: Mexicans, Mexicans-Americans and others will be celebrating “Cinco de Mayo” this weekend, Saturday, May 5, 2012 with music, food and festivities. 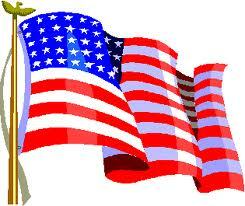 It is an event that has become very popular in the United States. However, Cinco de Mayo is often confused as Mexico’s Independence Day. CINCO DE MAYO is the celebration of the Battle of Puebla, Mexico in 1862 with Mexico’s victory against a French invasion. It honors the bravery of the small Mexican militia of 4,000 in a fierce battle and victory against a strong powerful French army of 8,000 of Napoleon III. WHENEVER “Cino de Mayo” is mentioned the name of General Ignacio Zaragoza immediately comes to the minds of Mexicans who live in Mexico. 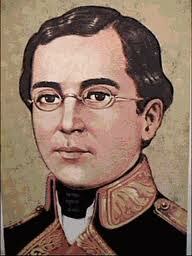 Gen. Zaragoza was their hero because he led the Mexican army to the victorious Battle of Puebla [Batalla de Puebla]. At the age of 33, Gen. Zaragoza contacted typhoid fever which led to his premature death on Sept. 8, 1862. 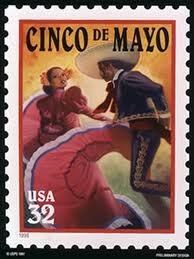 THE UNITED States Postal Service issued the first Cinco de Mayo stamp in 1998. It was re-issued in 1999 with a 33 cents face value. FESTIVAL: The Little Village Chamber of Commerce is sponsoring a 3-day “Cinco de Mayo” festival. The festivities will begin on Friday, May 4th from 6 p.m. to 11 p.m., Saturday, May 5th from 12 Noon to 11 p.m. and Sunday, May 6, 2012 from 12 noon to 11 p.m. at 26th St. & Kostner Ave. FEATURED ENTERTAINMENT by special guests Cynthia Rodriguez, Erick Sandoval, Estilo Especial, Adikto, Julie Cortez and the explosion de la cumbia and Group Veloz. There will be music, food, a carnival and games at the festival for everyone to enjoy. For more info call 773/868-3010. Mexicanos, Happy Cinco de Mayo! LVCC MOBILE SECRETARY OF STATE SERVICES: Anyone in need of any of the services listed below from the Secretary of State’s Office is invited to come to the Little Village Community Council, 3610 W. 26th St. from 10 a.m. to 2 p.m. on Friday, May 18, 2012, no appointment necessary. Seniors age 75 and up. Need to visit DMV to renew driver’s license. PROPER identification will be needed for the above services. Form of payment: Cash, Check, Credit Cards accepted [American Express, Master Card, Discover, NO VISA]. THE WALL: There was a gathering of young people and adults from Little Village at the Manuel Perez Jr. Memorial Plaza, 26th St. & Kolin Ave. on Saturday, April 21, 2012. Residents were asked to finish a sentence printed on the wall that reads: “Before I die……. ”. The concept is part of an interactive public art project which invites people to share their wishes, hopes or dreams within a public space. Similar to a “bucket list” people wrote, in chalk, their aspirations. “Before I die…..” project is sponsored by the Little Village Chamber of Commerce, Chicago Urban Art Society, Uprising organization and Good News Gallery. Some of the writings on the wall are: “Before I die I would like to see world peace.” “I would like to visit my abuelita’s [grandmother’s] pueblo in Mexico.” I would like to see the Cubs win the World Series.” “I would like to become a fashion stylist.” I wrote “I would like to see more Latino’s voting!” This is an ongoing process with room for more participants. Pilsen, Edgewater, Hyde Park and Brighton Park have similar walls. NILDA ESPARZA, Executive Director of the Little Village Chamber of Commerce and her staff oversaw the “Before I die” project. Abigail Wood-Lizalde represented Universidad Popular and her UPRising group helped with the installation. Landscapers from Brickman Co. installed flowers in front of the wall.“We encourage people to visit the wall,” said Esparza. The “Before I Die” wall is turning into a global art project, expanding to cities around the world, including Amsterdam, Portsmouth, Queretaro, Almaty, San Diego, Lisbon, Brooklyn, London and beyond. ARTIST CANDY Chang is the creator of the “Before I die” wall. She turned the side of an abandoned house in her New Orleans neighborhood into a giant chalkboard, painted and stenciled the sentence “Before I die I want to"
COLLAGE WORKSHOP: More than 75 high school students and parents attended the Scholarship Informational Workshop sponsored by Chicago Public School [CPS] West Side High School Network and the Little Village Community Council at Benito Juarez Community Academy High School Thursday, April 26, 2012. PRESENTATIONS given by: Marcia Boyd, CPS Office of Pathways to College and Career featuring Financial Literacy; Maria Bucio, assistance for undocumented students; Abel Montoya, Illinois Student Assistance Commission: State Student Aid; Kristen McRoberts and Carole Wood, City Colleges of Chicago. The event was a success. ART EXHIBIT: Carlos Arango, President/Director and Efren Beltran, Originator-Curator at Casa Aztlan, 1831 S. Racine St. [18th & Racine] are extending an invitation to the public to visit its Art Show Exhibition opening reception Friday, May 4 at 6 p.m. 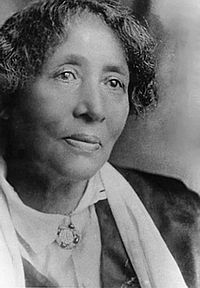 THE EXHIBITION is honoring the life and legacy of Lucy Gonzalez Parsons [1853-1942]. Parsons was an activist, feminist and labor organizer in 1915 Chicago. Theme of the event is: Hard Day and Time of Change [Dias Dificiles – Tiempo de Cambio]. Artwork by Victor Montanez with guest artist-activist Diane Kahlo. The exhibition will be open from Friday, May 4, 2012 to Friday, May 25, 2012. OTHER PARTICIPANTS will be Arturo Miramontes, Diana Solis, Esperanza Gama, Oscar Romero, Victor Montanez, John Weber, Roman Villarreal, Jose Andreu, Jesus Macarena, Rachel Heuman, Saul Aguirre, Eric Garcia, Griselda Laureano and Edgar Solorzano. Music will be provided by Maestro Chuy Negrete who will sing the “Corrido Lucy Parsons”. FOR MORE information contact Patricia Perez, Executive Assistant at 312/666-5509x122. Thursday, May 3rd to May 6--Cinco de Mayo Festival at Douglas Park, Ogden Ave. & California Ave. from 10 a.m. to 10 p.m. Sponsored by Cermak Chamber of Commerce. Friday, May 4th from 6 p.m. to 11 p.m., Saturday, May 5th from 12 Noon to 11 p.m. and Sunday, May 6, 2012 from 12 noon to 11 p.m. "Cinco de Mayo" Festival at 26th St. & Kostner Ave. sponsored by Little Village Chamber of Commerce. Sat., May 5th Cinco de Mayo Tequila Festival presented by Hispanic Pro, 3 p.m. to 7 p.m. Vertigo Sky Lounge, 2 W. Erie St. Early bird online ticket price: $15. Call: 312/867-0631.